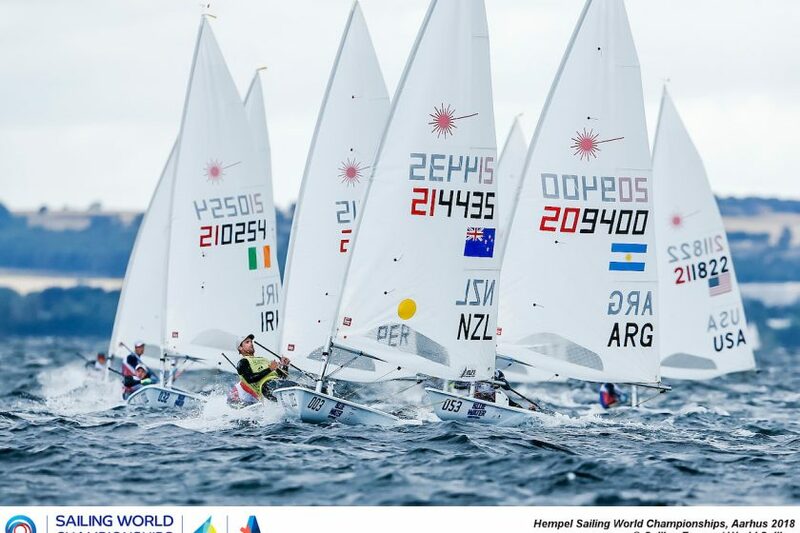 (Aarhus, Denmark) Two races were completed on the second day of Laser racing at the Hempel World Sailing Championships. The wind was shifting above the rigs in the morning, from five knots suddenly to 15. There was less cloud cover than forecast and the cumulus clouds drifted out over the race course, losing their heat source of the land and dumping wind onto random parts of the course. The westerlies were a soothing and familiar balm after months of unusually tropical high-pressure conditions. 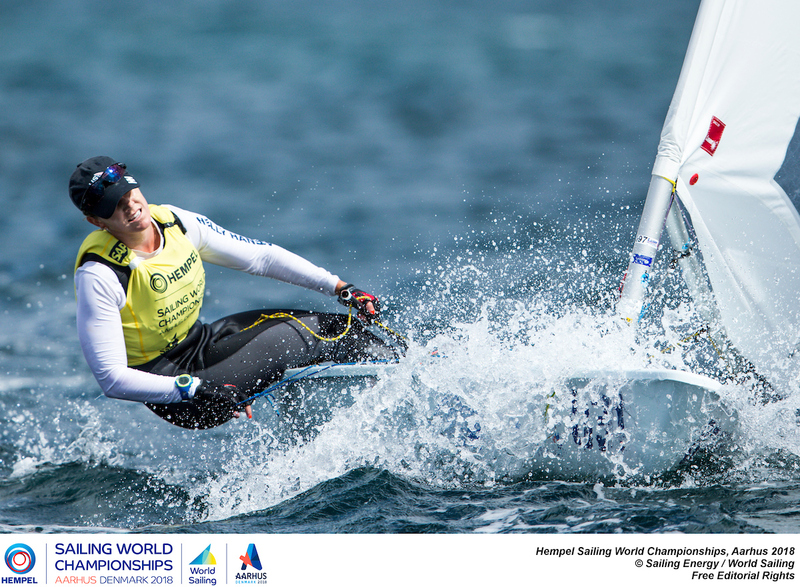 In the Laser Radial, USA’s flagbearer Paige Railey stayed at the top of the leaderboard despite a more difficult day in which even Marit Bouwmeester (Netherlands) could not find a way, finishing 28th in her second race. Denmark’s Anne-Marie Rindom also faced some challenges in the second race of the day, but maintained a strong first race to sit behind Railey on the leaderboard. Following the same pattern, Line Flem Høst of Norway finished 5th in the first race and 27th in the second race, to be currently sitting in third overall. In the Laser Standard, New Zealander Sam Meech followed his two wins on the first day with first- and second- place finishes for Day 2 in the yellow fleet. “A little bit of luck today,” says Meech. “There were some pretty scary moments because it was really, really tricky sailing out there. There were 90-degree wind shifts at times so I was just in the right place at the right time. It’s been an awesome start. I am loving the racing out there. “Obviously there’s a lot of racing to go and we’ve got some racing on some pretty tricky courses coming up. It always helps [to have a good start] but it’s only the qualifying so far. The real action happens in those last two days of gold fleet. Finland’s Kaarle Tapper and Rio 2016 Olympic Champion, Tom Burton (Australia) both had a solid day of racing for Day 2. Tapper won his first race of the day and paired it with an eighth in the blue fleet, while Burton started with the day with a sixth and won his second race of the day in the red fleet. Tapper is sitting in second, with Burton close behind in third overall. Racing in both championships continues today with 2 more qualifying series races scheduled. Forecasted offshore westerlies will continue to build over 20 knots – gusting 30 – on the furthest courses out in the Bay of Aarhus.